MAALAEA, Maui » A Honolulu-based fishing vessel caught fire in the generator compartment as it traveled about five miles west of Lahaina. But the crew, on the brink of abandoning ship, suppressed it until the Coast Guard arrived to put out the blaze yesterday morning. "We were lucky," Capt. Mike Christie said. "We thought we were about to have a full-blown fire." Coast Guard spokesman Petty Officer Michael De Nyse said Christie and the crew followed all the emergency procedures necessary for a successful rescue. "He did everything absolutely by the book," De Nyse said. Christie was taking the 40-foot vessel Catch N Carey from Kailua-Kona, where it was repainted, to the Ala Wai Yacht Harbor in Honolulu. Christie and the vessel's owner, Ken Carey of Los Angeles, and Carey's son Kevin had spent Monday night in Lahaina. The crew said they were about 45 minutes to an hour out of Lahaina when the instrument gauges indicated there was a problem. "Something didn't look right," Christie said. Christie said he slowed the boat after more gauges malfunctioned and the crew smelled smoke. He said he opened the back to the generator compartment. "There was a lot of smoke everywhere. We had trouble breathing," Christie said. "So we put it back down." 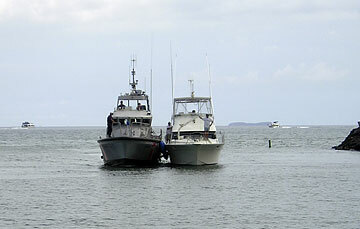 The Coast Guard towed the 40-foot vessel Catch N Carey, right, to Maalaea Harbor on Maui yesterday. The crew put on life jackets and called the Coast Guard to notify them of their position, then gathered all the fire extinguishers and fired them into the generator compartment. Meanwhile, the life raft was prepared and flares were fired, Kevin Carey said. Christie said the crew was down to its last of four fire extinguishers. "We nailed it. We closed the top and tried to smother it," Christie said. A Coast Guard crew arrived on the scene in 30 minutes at about 9 a.m. and put out the fire, De Nyse said. Another Coast Guard boat towed the Catch N Carey to Maalaea Harbor. The Careys said Christie did a good job in reacting. "Mike was real cool," Kevin Carey said. Ken Carey said the fire may have been caused by an electrical problem. He said he's not thinking about the estimated damage. "I'm just thinking I'm happy I'm on terra firma," he said.